Sod is fully established pieces of lawn that is harvested in long, narrow strips. Sod is a fast method to produce a lush grassy area, sod prevents weed growth and sod can be installed any time during the growing season. Sod is more costly than planting grass seed and requires watering maintenance to prevent damage to the sod. Properly laid sod will establish roots quickly and prevent soil erosion. Prepare the lawn area by tilling the soil to a depth of 6 inches. Remove all vegetative growth and rocks from the soil. Work 2 inches of organic compost or quality topsoil into the area to increase the nutrient value and moisture-retention properties. Smooth the soil surface with a rake. Compact the lawn soil by using a lawn roller filled with water for weight. Roll in straight lines across the soil area to create a smooth surface. Water the surface of the soil with 1ne inch of water 24 to 36 hours before laying sod. This will moisten the soil to assist with root establishment. Apply a lawn starter fertilizer to the surface of the soil. Lightly rake the soil to set the fertilizer just under the surface. Purchase sod and install it immediately to prevent drying and damage to the grass. Place the unused sod in a shaded location to prevent sun damage during the installation process. Lay the first row along a straight edge with the second row pushing right up next to the first. Do not leave gaps between the rows. Lay the short ends in a brickwork pattern so they do not line up with each other. Tamp the edges of the sod by using a rake to firmly push down each edge of the sod. Fill in any gaps with topsoil and gently tamp in place. Lightly roll the newly laid sod with a lawn roller filled half full of water. This will assist with knitting the root system into the soil. Water the sod lawn generously so it absorbs to a depth of 6 inches immediately after the sod is installed. Continue to water the sod daily in the early morning for the first week. Water the sod every four to seven days with 1 inch of water after one week of growth. Do not over-water to create pooling of water. Mow the newly laid sod three to four weeks after installation and once the roots have established into the soil. Do not mow more than one-third the length of the grass blade. Use a mower with a sharp blade to prevent damage to the sod. 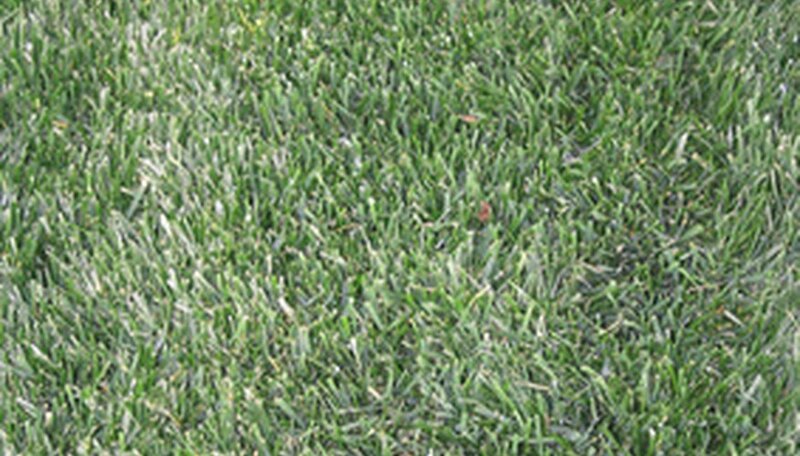 Apply a complete lawn fertilizer with a ratio or 2-1-1 to the sod after the first mowing. Continue to fertilize the lawn on regular one-month intervals throughout the growing season. Sod with established roots can not be easily pulled up from the ground. Lawn rollers are available to rent from garden-supply centers. University of Vermont: Seed or Sod? Jennifer Loucks has been writing since 1998. She previously worked as a technical writer for a software development company, creating software documentation, help documents and training curriculum. She now writes hobby-based articles on cooking, gardening, sewing and running. Loucks also trains for full marathons, half-marathons and shorter distance running. She holds a Bachelor of Science in animal science and business from University of Wisconsin-River Falls. What to Do When Sod Turns Brown?